This Shabbos we find an emphasis on halves. Being Shabbos Shekalim we encounter the Machatzis Hashekel which was used to establish a fund from where communal sacrifices were purchased thereby bringing an atonement for Klal Yisrael. This mitzvah has a paradox within itself. On one hand we see that the Torah emphasizes that one must give the half amount of the 20 geirah coin which is the weight of ten geiras. The Torah could have easily stated to give ten geiros yet we see that it emphasized a half of 20 and not ten. What is the deeper understanding and mindset that the Torah demanded from everyone with the donation of a half over ten gairos? Even from shamayim they stressed to Moshe the half component by demonstrating to him a half shekel fiery coin. Yet on the other hand we find the Rambam in Hilchos Shekalim telling us that the money must be given entirely all at once and not in halves, thirds, or quarters or with any other installment plan? At the end of the parsha we encounter the Blood Bris that Moshe made between Yisrael and Hashem. The firstborn of Yisrael offered up burnt offerings and they slaughtered bulls as peace offering to Hashem. Moshe took half the blood and put it into two basins and half the blood he cast on the alter. Moshe then took the Sefer Habris (from the beginning of the Torah until the mitzvos given at Marah) and read it aloud and they said נעשה ונשמע. Moshe took the blood and sprinkled on the people and said “This is the blood of the covenant which Hashem has made with you regarding all these words. The dividing of the blood in half was an exact divide without an extra drop falling into one division over the other as Rashi points out that a malach in the form of Moshe came and divided it (Vayikrah Rabba 6,5). Just like in the half shekel the half was demonstrated to Moshe from shamayim as we mentioned above, so too the perfect divide of half the blood was achieved with the help from shamayim also to impress upon everyone exactly a half, not more, not less. The Oheiv Yisrael explains this deep concept of halves. 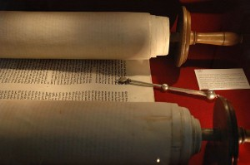 The relationship of Hashem and Yisrael is identical to one of a Chosson and Kallah. (Shmos 19,17 Rashi). A man without a wife and a wife without a husband are considered only a half body. That is why at Shevah Berachos we recited the beracha of יוצר האדם which seems more apropos to be recited at the time of birth. Hashem’s love and motivation to benefit Klal Yisrael forms such a relationship that Hashem considers Himself without Yisrael only a half entity. This is the secret of the Kabbalistic term ליחד קב”ה עם שכינתיהThrough mitzvos and Torah learning, Hashem the Chosson, unites with His Kallah, with the Shechinah, that dwells in every Yid. The Ohaiv Yisrael continues that when kings make a treaty between themselves each one drinks wine in which a drop of blood of the other king was mixed inside. Since blood is the nefesh of man, the drinking between the two conveys that this treaty creates such a strong unwavering unity between them by each one committing a loyalty to sacrifice his life for the other if need be. So too, this Blood Bris between Hashem and Am Yisrael demonstrated that Yisrael is willing to sacrifice themselves for their Chosson and their Chosson is committing to stand by his Kallah and never leave her. We can apply the same interpretation to the Machatzis Hashekel. The sefarim write that the word שקל is gematriah נפש. Just as blood represents the life force in a person, so too, the שקל symbolizes the life force. This can be better understood in the light that the Medrash says that Hashem showed Moshe a fiery Machatzis Hashekel taken from under the Kisey Hakavod which is the same place that the neshamos of Yisrael emanate. The Torah was exacting when it commanded the giving of the Machatzis Hashekel because it wanted to portray the relationship between Hashem and Yisrael as two halves as if Hashem is dependent upon the mitzvos and love of His Kallah תנו עוד לאלקים. The sefarim tell us that the name of the angel that split the bloodמטטרון (see Shmos 23,20 Rashi). An allusion brought to prove this is the gematriah of מטטרון which equals חצי הדם hinting that this was the name of the malach sent from shamayim to divide the blood. Although this topic is very deep I would like to present a Mussarthought to this concept. The sefarim tell us (see Yevamos 16b Tosfos) that the Malach Mattron who is also called the Sar Haolam was originally in the form of a person named Chanoch of which the Torah speaks about in Bereishis 5,24 ויתהלך חנוך את האלהים ואיננו כי לקח אותו אלהים. Chanoch followed Hashem but he could be easily misled so Hashem saved him and took him away prematurely (Rashi). Chazal say that Chanoch was a shoemaker and on every stitch we would have holy deep kavannos מיחד יחודים. The Kabbalists interpret his avoda in their lofty way. The Baalei Mussar translate this to mean that on every stitch he made sure that it was the best workmanship he could do lest there might be a slight shortcoming in his בין אדם לחבירו. I once heard a third incredible interpretation in the name of Rav Shmuel Charkover. On every stitch Chanoch kept on reminding himself I am not a shoemaker. Many people unfortunately identify who they are by their relationship to their work, job, parnassah etc. Chanoch was teaching us that this should never be the case. Our relationship is with Hashem and He is the sole purpose of our being placed on earth. Work and everything else is only a means and a conduit to fulfill that one mission of revealing the glory of Hashem and should never be used as an ends. One must keep on reminding himself of his true identity which is with Hashem for this is very easy to forget in the midst of the jungle of our Tsunami World. It was Chanoch who descended in the form of Mattron, for nobody else could tell Klal Yisrael better than him that the Bris with Hashem identifies us as one who dedicates our lives to be married and to love our Chosson to the point, that even when it is necessary to occupy ourselves with mundane issues it is only because of our love for Him that we do so. Chanoch’s participation through Matatron in the Blood Bris, is conveyed through the gematriah of his name חנוך which equals 85 including the name. His name is hinted in the gematriah of the first letters of the passuk ויקח משה חצי הדם וישם באגנות וחצי הדם זרק which is also 85. His involvement in the Bris is also alluded to in the passuk (Mishlei 22,6) חנוך לנער על פי דרכו גם כי יזקין לא יסור ממנה Chanoch is associated with the pessukim that speak of נער such as our passuk of the Bris וישלח את נערי בני ישרראל ויעלו עולות ויזבחו זבחים שלמים לה’ פרים נער. Chanoch taught Yisrael by dividing the blood into perfect halves that one must focus on על פי that one must constantly make a verbal reminder of his spiritual identity and destiny which isדרכו the derech of Hashem. With this constant reminder, he protects himself even כי יזקין overtime when rote and habit set in, and through difficult challenges which tests one’s dedication to Hashem. לא יסור ממנו his constant reminders won’t allow himself to think or act as an individual who identifies himself as a shoemaker or any other profession, other than creating a deeper and more intimate relationship with his Chosson, Hashem Yisbarach. Now we can understand that there is really no paradox in the laws of Machatzis Hashekel. It is true that the mitzvah is to give specifically a half shekel. However, when we understand that the half shekel reveals that one is fully dedicated to bond his life force with that of Hashem’s who represents the other half, one cannot reach a loftier wholesomeness than that! So do as the Rambam writes, to give it all you got in one shot because you’ve just one the jackpot.